How to use social media to create a billion-dollar brand - Edit. We all use social media in our everyday lives now, so it’s no surprise that it can be a great technique to drive business success and growth. I think that every brand should be vocal over social media to engage with their audience but also to find their own tone of voice. Below are five top tips to grow your brand over social media and I’ve included a few shout outs to brands that are doing it so well. Sometimes brands can use social media inappropriately thinking they have to be present across everything from Twitter to Snapchat. However, you need to make sure you have a reason to be on that platform. For example, a make-up brand has strong visuals and will be engaging with platforms such as Instagram and Snapchat, whereas a technology company may be less visually appealing. As a rule of thumb, if you have any doubts about being on a particular platform, then you probably shouldn’t be on it. It’s important for you to develop a brand voice and know who you are. Once you’ve defined this voice (it can take time and doesn’t usually happen overnight) you can use it across all your social channels. One brand that really nails their tone of voice is KFC. They are light hearted and fun, which shines through their tone of voice. 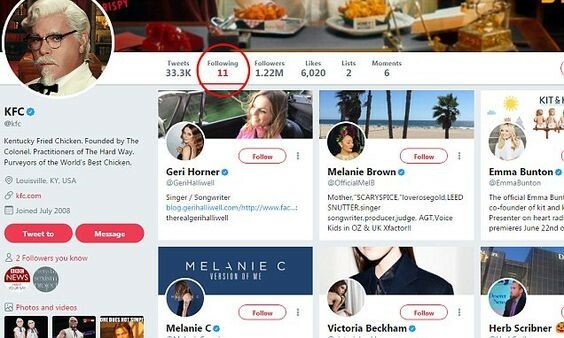 One simple technique that had them featured in almost every national newspaper late last year was when they followed all five Spice Girls, along with five men all named Herb. This paid homage to their famous ’11 herbs and spices’ chicken recipe. This was such a simple idea but ended up attracting worldwide media coverage and praise – bravo, bravo! It’s safe to say KFC have had a bit of a rough time at the moment after their DHL disaster which rendered the whole of the UK without fried chicken. However we have to give them credit for their response which included a full page apology in the sun. Read more about KFC’s chicken scandal in our blog post here. Once you’ve nailed your tone of voice, you need to make sure you’re engaging with your audience. This can come for creating engaging imagery or sharing popular news/trends. Anything you think is related to your brand that will get people talking. Make sure if people are asking questions they are answered quickly and if they comment on any posts, they get a reply. Leaving your audience to themselves will just turn them off and they won’t come back. Once you’ve nailed your tone of voice and you’re engaging with your audience you need to make sure you keep it up. I’d recommend a two-week rolling content calendar across all your social media accounts. Channels such as Twitter require a little bit more frequency than Facebook and LinkedIn, and be mindful that the content needs to be tweaked for each channel. A simple way of filling out your calendar is making sure you target any awareness days/national holidays. We’ve created a PR Calendar packed with notable events, which makes a great foundation for any PR and social content calendar. This can be seen here. It’s vital to remain consistent on social media. If you’re not posting regularly your audience will become disengaged. Having said that, never post just for the sake of it – each post should have a reason and a call to action if it’s appropriate. The best brands are reactive and quick. Time is key on social media and you need to make sure each piece of content is quality. These are just some simple tips that can help you hit the ground running across your social media channels. Love them or loathe them, the Kardashians know how to build a brand (or should I say empire). 20- year old Kylie Jenner launched her own signature Kylie Lip Kits in November 2015. Cut to just over two years later and she’s surprised everyone by amassing retail sales of close to $420 million. Pretty impressive when compared to other beauty brands such as Estee Lauder, who took almost a decade to get anywhere close as this. With everything on track, Kylie Cosmetics is set to make a billion-dollars in revenue by 2022. With over 100 million followers on Instagram Kylie has a huge existing fanbase and audience. 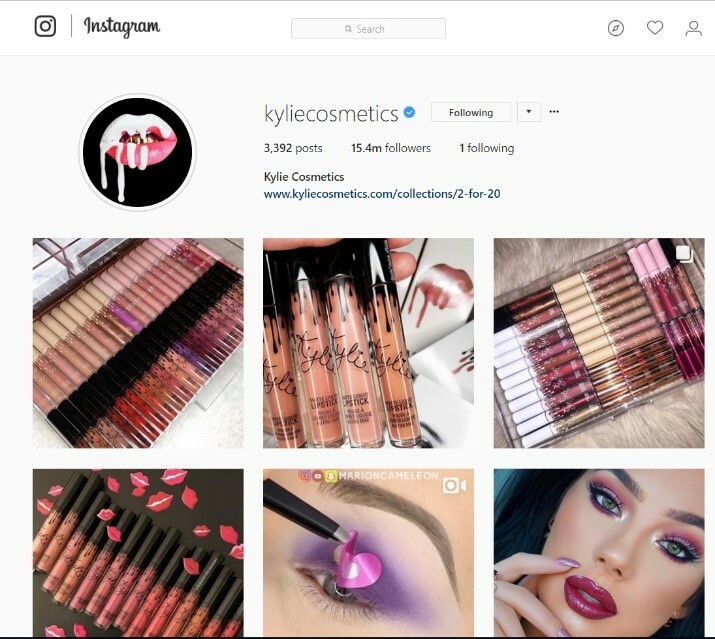 Although few brands can start off on this foot, there’s no denying that Kylie has made the best out of an opportunity by making this online business appeal to her fans. Her business model has social media at its heart and this is working amazingly for her. To tease fans, Kylie will often post new product launches on her personal social media before they drop, as well as on Kylie Cosmetics’ channels too. The exclusivity of the product drops (this is where they only have a certain amount of the product in one wave so that they sell out) ensures that the brand remains desirable and guarantees the new release is the must-have product. The smoothie brand are renowned for their social media channels and are always seen as the ones to watch. The reason Innocent do it so well is that their accounts are genuinely interesting and something that people actually want to read. Their social channels are really fun, and it gives them space to reach out to all of their customers and keep them interested in the brand. They are very light hearted over social media and not afraid to laugh at themselves. I think this makes for a very successful account and brand tone. Below is an example of one of our favourite tweets of theirs. It shows humour and engaged really well with the audience. High-five to the Innocent guys for an amazing job over social media.